This self-portrait, taken by NASA's Mars rover Curiosity on Jan. 23, 2018, shows the vehicle on Vera Rubin Ridge, which it's been investigating for the past several months. Poking up behind Curiosity's head-like mast is the 3.4-mile-high Mount Sharp. 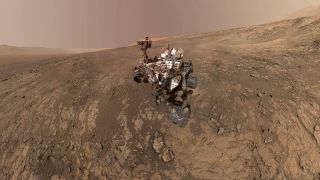 A new self-portrait by NASA's Mars rover Curiosity shows the dusty robot hard at work on the slopes of a towering Red Planet mountain. Curiosity took the selfie on Jan. 23 from Vera Rubin Ridge, a site about 1,000 vertical feet (300 meters) up the flanks of Mount Sharp. This massif rises about 3.4 miles (5.5 kilometers) into the Martian sky from the center of Gale Crater; its peak is obscured by Curiosity's head-like mast in the new photo. "The mountain's base provides access to layers formed over millions of years," NASA officials wrote in a description of the selfie, which was released Wednesday (Jan. 31). "These layers formed in the presence of water — likely due to a lake or lakes where sediments accumulated, which formed these layers inside Gale Crater." Curiosity has been exploring Vera Rubin Ridge for several months now. Over the next few weeks, the mission team plans to drive the rover up the slope directly behind it in the photo, to check out some clay-rich deposits, NASA officials said.